When I do not know something about a wine or a grape or a region, I often first refer to the two most essential books that, in my opinion, everybody (wine lover or not) should treasure in his (or her) personal bibliotheca: “The World Atlas of Wine” and more especially, the “Oxford Companion to Wine”. I’ve personally been using these two books for the last 18 years(+). At the beginning of my career, while turning each page with the utmost interest and finally understanding why my grandfather loved wine and winemaking so much, these two books proved to be extremely helpful in many ways and somewhat determined my path as a future wine buyer. I never put them down since. I know that there are plenty of other great books about wines, but with those two, you will not need much more to become extremely knowledgeable about wine and everything that surrounds it (like geography, topography, types of soil, climates and microclimates, grapes, vine growing, winemaking, and much more). I hear you say: “no need for such books now with the internet!” Well, I’ll need to disagree. Internet is surely a great source of information, with an infinite growing number of pages, websites, articles, posts and notes about wine and its world. Yet, and I hope that I’m right when I say that (and even if I have tremendous respect for the forests, the nature and the environment overall), a book will always remain a better source for a specific amount of information at a given time and will always be by your side if you need it. It is a bit old school, I admit, but it works, any time, any day. True, you can not browse as quickly many pages at once and it will never be updated as fast as an internet site… yet it may, in some ways, be more accurate, explicit, straight to the point and factual…. However, what will you do if your computer crashes unexpectedly? Or what if a sudden electricity blackout strikes your area? You will have to go back to your good old books, that’s what you will do. Remember to never trash the irreplaceable classics (that goes for everything), they will always be non-negligible references no matter what. “The World Atlas of Wine” was first written and put together by Hughes Johnson about 30 years ago, and still remain one of the best books about most wine regions of the world, boasting an impressive amount of wine region maps complemented with clear, straightforward explanations. Jancis Robinson joined him and teamed with him some years ago, to create one of the most dependable wine book ever written. Hughes Johnson's wine guides have always been standards of connoisseur's bookshelves, although I remember countless arguments that him and I had regarding certain wines when we talked while he was having lunch at the restaurant. We have slightly different palates, that's all. Talking about Jancis Robinson (MW), one of the first female Master of Wine, imagine, “The Oxford Companion to Wine” was basically her thesis to obtain her Master… and consequently, she immediately became one of the most recognized wine authorities in the world and still nowadays enjoys a great deal of press coverage and followers with her books and blog, continuing to lead the way as one of the most knowledgeable wine writers. I had the pleasure to meet them both in many occasions when I was working as Wine Buyer in London: Jancis Robinson in quite a few tastings in London but also in Bordeaux for the “Primeurs” and even in New York. And Hughes Johnson was a regular customer to the restaurant where I was working as a Chef Sommelier, called “CHE” located in the economist on St. James Street in London. Without knowing it, both were very inspirational. However, let get back to our wine of the day which is bringing us back to one of my favorite Italian wine region: Piedmont. If I started this post talking about how to find references to things related with wine in the books of Hughes Johnson and Jancis Robinson, it is because I recently came across a grape variety that I never heard of before and needed an explanation. I now more and more browse out the internet for answers rather than books (I admit it, it is easier and faster, although not always accurate and demand more attention and research), but I felt the need to mention these two books because they were the precursors of nearly everything that you can find on the internet regarding wine maps and wine knowledge, before the commercialization of the international network (in short "internet") in the mid 1990s. Ever heard of “Favorita” grape variety? Me neither, until I tasted this little Piedmont’s white wines imported by Kermit Lynch. So I looked into my Jancis Robinson’s “Oxford Comapnion to Wine” and on her website and found out that “Favorita” is another name for Vermentino in Piedmont and that it ages better than Arneis. Well, it is only part of it. With a bit more research, one can come to the conclusion that “Favorita” is a white Italian grape variety primarily grown in Piedmont. The results of recent studies of its DNA indicate that it is somewhat linked to Pigato and Vermentino, two other Italian white grape varieties. Commonly used as a table grape in Piedmont due to its larger berry size, it is apparently on the decline as Arneis and Chardonnay have increased in popularity over the last 10-15 years. “Favorita” is not widely planted and only a few producers still use it as part of the blend in some of their whites. One of these producers is Elvio Tintero. Azienda Agricola Elvio Tintero is located on steep but spectacular hills of Mango, a small village of ancient historical and cultural traditions situated between the Langhe and Monferrato areas (in the province of Cuneo in an area called “Località Gramella”); about 12 kilometers southeast of Barbaresco and about 18 kilometers east of Alba (and about 60 kilometers southeast of Torino), nestled at about 450-500 meters above sea level in the hilly region south of the Tanaro river. On these hills, the Tintero family has been taking great care of their lands and tending their vines for 3 generations. Nowadays run by Elvio, Mark, Cynthia and Adriana, the winery represents a symbol of tradition and prestige. In the 80s, attracted by the potential of the omnipresent Muscat grape (called Moscato in Italian) in the area and from the optimal position of the vineyards (south, the south-west) the Tintero family decided to expand their experience and production. At the same time the Controlled Denomination of origin (D.O.C. or Denominazione di Origine Controllata) was reaping its first fruits in aiding the development and protection of this product. It is only about 10 years later, around 1993, that the slightly effervescent and slightly sweet Moscato white wines attained high quality and started to have a certain recognition, thanks to the D.O.C. Although a company linked to the traditions, Tintero winery follows with great perseverance and commitment to the evolution of the market and its demands. Their consistent research is devoted to product quality not only as an element related to sensory aspects but also in respect of the balance of nature linked to it. In fact, Tintero owners are constantly attentive to the evolution of the different ecosystems using more appropriate and natural agronomic practices, less "revolutionary" but more adapted and in respect with environment. The winery and vineyards management are monitored by qualified personnel allowing compatible methods to be used, with daily concerns for the environmental protection and the maintenance of the countryside. The winery produces about 8 wines: 4 whites (Langhe DOC Arneis, Moscato d’Asti DOCG, Langhe DOC Favorita and Grangia) and 4 reds (Barbaresco DOCG, Dolceto d’Alba, Langhe DOC Freisa and Barbera d’Alba). “La Grangia” is the name of a part of the estate, which is also used to welcome agro-tourists. The name “Grangia” goes back to Cistercense architecture and defines an enclosed place near the convent in which the harvest was stored. Recently refurbished as a Bed & Breakfast, "La Grangia" is located in the midst of lush vineyards no more than a five-minute walk from the village of Mango (see the above picture, beautiful). Overlooking the vineyards and the gentle surroundings hills, “La Grangia” is enveloped by a splendid soft hillside landscape that makes the environment relaxing and unique. “Grangia” also gave its name to a surprising dry white wine that I really enjoyed and discovered a little while ago during a Kermit lynch tasting at the store. Although most of the producers of the area are mostly concentrating on producing slightly sweet Moscato d’Asti, Tintero winery, which possesses vineyards of the rather unusual Favorita grapes, decided to produce a dry version of it named “Grangia”. Made with roughly 90% Favorita and 10% Moscato (to add aromas) from carefully selected and hand harvested grapes from their organically managed vineyards, this gentle and summery fizzy white wine is an enjoyable surprise. It could almost be compared to a Vinho Verde from Portugal, with a bit more complexity and length. Grangia has a very pale greenish color. Clean and clear with tiny bubbles, it seems super light in appearance. The nose offers complex yet discreet aromas of white and yellow fruits like peach, citrus and apricot intermingled with blossom and other floral notes. A touch “perling” on the tongue (as we say in French), the palate is light, elegant and easy, quite friendly, and boasts slightly different and crispier flavors than the nose including green apple, lemon zest and lime peel combined with mineral and enhance by a great acidity. Lingering dry, zesty finish. Overall, it is a pleasantly enjoyable summer wine to enjoy at any time with or without food. Yet , some “Frutti di Mare” will complement it perfectly, especially oysters, shrimps and mussels. The post of today is bringing us back in the southwest of France; in the region of Bergerac surrounding the village of the same name, located about 57 kilometers (35.5 miles) east of Saint-Émilion, and more precisely in the appellation of Saussignac. Saussignac is a small village in the Dordogne department, nestled in the heart of the Bergerac wine region, and located about 18 kilometers southwest of Bergerac and 10 kilometers southeast of Sainte-Foy-la-Grande. This charming little village gave its name to the surrounding wine region, which exclusively produces sweet white dessert wines, on the southern bank of the Dordogne, a stone’s throw from the Gironde department. Somewhat similar yet a little drier and definitely lesser known than the neighboring wines from Monbazillac, the grapes used for Saussignac are generally botrytis affected Sémillon grapes. To qualify for the appellation, the grapes must be grown, and the wine produced, in the 4 villages of Saussignac, Razac de Saussignac, Monestier and Gageac-Rouillac. May be for practical but frankly and mainly for economical reasons, because they surely couldn’t survive only on their production of dessert wines, most producers of Saussignac also produce red, rosé and dry white wines, which can only be sold under the "Bergerac" and "Côtes de Bergerac" appellations. Due to lack of reputation and promotion of the region and the wines in the export markets (outside of a few European countries), the local estates and Châteaux have diversified their portfolios by producing various appellations wines within the Bergerac region. They are often open for visits and always happy to guide you with a tasting of their reds, rosé, dry and sweet whites. Located in the little village of Razac de Saussignac (about 5 kilometers west of Saussignac), Château Le Payral is a small family owned property, run by Thierry and Isabelle Daulhiac. In 1992 Thierry inherited the vineyard from his father who had, in turn, inherited it from his father. Besides being a wine estate, Château Le Payral is a large, welcoming, 19th century manor house, which is also used, has a Bed & Breakfast for agro-tourists, offering to its guests, two huge, cozy and comfortable bedrooms. However, the estate extends over 15 hectares (37 acres) of hillside vineyards in the Saussignac and Bergerac appellations (AOC), comprised within the region of Bergerac and located between the appellations of Monbazillac and Sainte-Foy-Bordeaux. Since 1992, Thierry has gradually adopted more natural vineyard management methods, and nowadays, the vineyards and cellar are entirely managed in organic culture tending more accurately towards Biodynamic. 0.60ha (1.48) of Sauvignon Gris. 2ha (4.94 acres) of Cabernet Franc. As previously stated, although based in Saussignac, for practical and especially economical reasons, Chateau le Payral produces understandably much more Bergerac dry wines than Saussignac sweet wines, the later only being produced when weather and micro-climate ideal conditions allows it (thus a challenging production and not a good source of revenues). Out of the total production, 40% of the bottles are sold to the local markets to retails, cavistes, restaurants and wholesalers; while 60% are sold to the export markets led by the UK (London more precisely), Belgium and Netherlands, and followed in smaller quantity by the United Sates of America and Japan. Their Bergerac white Sec, Bergerac red Traditionnel and Saussignac are consistently receiving the most recognition from the press and the critics, and are understanbly the ones that are found the most on the export markets. These 3 wines from Château Le Payral are available in New York, and part of Savio Soares Selections: Bergerac Dry White, Bergerac Red and the relatively little known rich, sweet, "liquoreux" Saussignac. Grown and nurtured organically with emphasize on biodynamic methods, the grapes are harvested so that quality is the best possible, preceded a few month earlier by a green harvest to maximize concentration and complexity, and followed by manual sorting at the winery before fermentation to keep only the most healthy grapes. The grapes undergo a maceration lasting 18 hours on average. Gentle pressing is carried out since 1998 with a pneumatic press, which ensures a smoother and more refine extraction of juice. The alcoholic fermentation starts after addition of natural selected yeast. During fermentation, the temperature is maintained at 18 ° C. Moreover, during the vinification process the lees are oxygenated, meaning that they are separated and aerated for one to three weeks until their full expression. They are then reincorporated. Shortly after the wine is bottled. An average of 50,000 bottles are produces, depending of the vintage. A blend of 50% Sauvignon Blanc, 25% Sémillon and 25% Muscadelle from vines planted on sandy-muddy-clay soils, the Bergerac dry white (Traditional) is very flavorful and extremely round in the mouth due in part to the blend of the three local white grape varieties, and also to the particular methods of vinification (skin contact, lees contact). The Sauvignon brings cleanness, crispiness and acidity. The Sémillon brings fruit weight and depth with complexity. The Muscadelle brings freshness and slight floral aromas. The resulting wine is a food friendly, earthy, versatile white to drink at anytime, enhance by a lovely acidity and a well-rounded mouthfeel. Mechanical harvesting provides a total de-stemming the grapes. Fermentation lasts from 15-30 days depending on the characteristics of the lot: ripeness of the fruit, color, etc… Initially, the pumping-over takes place twice a day, then only once a day at the end of fermentation. The goal is to break up the "hat of marc topping the must" (skins, flesh, etc…) in order to extract the best tannins and "anthocyanes" (color and flavor elements). During this period, the temperature is controlled and does not exceed 33 ° C. The malolactic fermentation takes place thereafter. Because full ripeness can somehow be difficult to reach and most Bergerac reds possess slightly hard tannins and hints of green that need a bit of time to settle for the wine to be more approachable, occasionally, they use micro-oxygenation on lots during aging, in order to "soften" the tannins a little too rough and thus obtain a wine easier to drink in its youth. About 28, 000 bottles are produces. A blend of 50% Merlot, 20% Cabernet Franc and 30% Cabernet Sauvignon from vines planted on sandy-muddy-clay soils, the resulting wine is quite nice and fresh and earthy, fairly rounded and easy drinking with good balance and acidity and slight tannic touch in the finish. Overall, a touch spicy, with rich, soft, red berry fruits flavors, it boasts generous ripe fruit with slightly peppery and herbal hints and good structure. This Saussignac is sourced from the oldest vines on the estate and is crafted out of botrytised Sémillon grapes in a small portion of the selected parcels with up to 4 'tries' or passes of the pickers in order to hand select the appropriate grapes from each bunch. Only produced in the best vintages that combines moist early morning with good amount of humidity and the right amount of sun during the day for ideal ripeness (like in 1997, 1998 and 2002), Saussignac is the château’s most prestigious wine, a rich "liquoreux" wine produced from the vineyard’s oldest white vines using the same methods as Sauternes. The region’s early morning mists and the proximity of the Dordogne river favor the development on the grapes of the fungus, Botrytis Cinerea, which is responsible for the high concentration of sugar level in the grape. It effectively causes the fruit’s skin to disintegrate and shrivel (or “raisins flétris” in French), which in turn leads to the evaporation of the water in the grape. The fruit dries out leaving behind a gray-purple blue dust partly covering the grapes. The grapes don’t, at this stage, look very enticing but their taste is surprising and wonderful, a bit like dried raisins. Harvesters with the most experience to choose the most concentrated grapes at each successive "tri" or passage slowly and carefully harvest them manually, going thru the same vineyards and rows up to 3-4 times over a period of a few days or even weeks sometimes. The harvest can go on till very late in the season, in 1999 the third and final "tri" took place on 24th November. It is hardly necessary to point out that yields are extremely low, generally speaking, 10-15 hectoliters per hectare. It is also an extremely risky business as, if the autumn is wet, the grapes will not become concentrated, noble rot will not develop and it will be impossible to harvest. Once harvested and pressed, this nectar ferments and ages in oak barrels for approximately 18 months. Made from 100% botrytised Sémillon, the resulting wine is absolutely delightful, sweet yet balanced and enhanced by great acidity with honey, apricot, coin fruit and ripe yellow fruit flavors. The palate is fairly rich and long and tremendously enjoyable. Great as an aperitif, or complementing a pan-seared slice of “Foie Gras Frais”, it will be ideal with pear or apple tart and fruit salad. Following my recently written 2 or 3 posts about Campania and its wines, like Terredora di Paolo (and Feudi di San Gregorio), where I explicitly expressed my attraction for the wines of Campania, I couldn't resist writing about another one of them. I also invite you to read them on my wine blog to have more info about the area and the winery, and will go straight to the wine description. Crafted by recognized oenologist Lucio Mastroberardino, Terredora di Paolo Falanghina is produced from 100% Falanghina planted on a 16 hectares hill-slope vineyard located near the village of Montermiletto, facing south-southeast, at an altitude of about 410 meters of altitude (about 1350 feet). 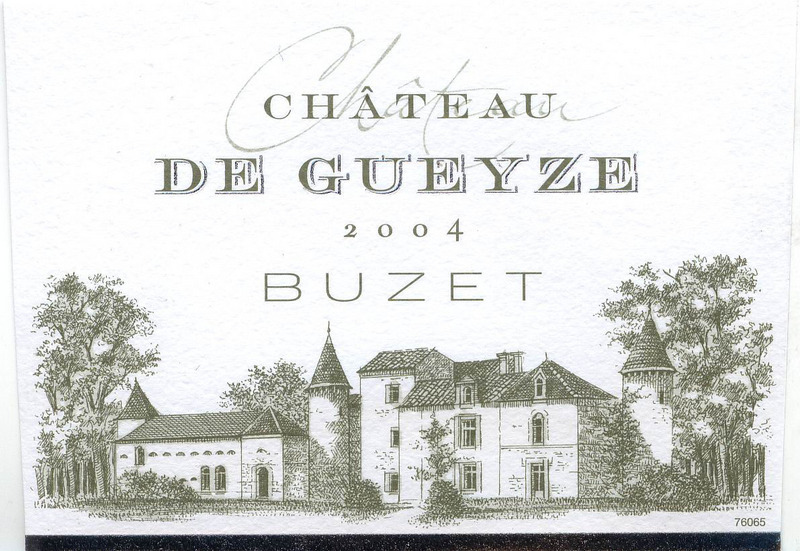 Growing on calcareous-clay soil, the vines are Guyot trained. Grapes are usually harvested in the second two weeks of October. The must is settled and then fermented at cool temperatures using selected yeasts. The wine is then aged on its lees in stainless steel for about 4-6 months and sees no oak. It remains in bottle for 6 months before release. About 80,000 bottles of this particular wine are produced each year. 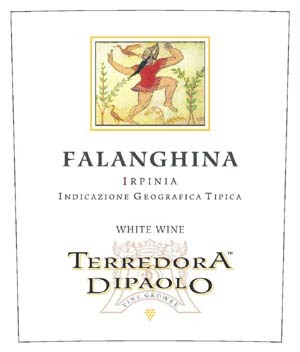 The 2009 Terredora di Paolo Falanghina has a pale straw color with slight green reflects on the rime. The nose is fresh and mineral, a touch herbal too, with white and yellow fruit aromas mixed with floral hints. The palate is also quite mineral with beautiful acidity and focus, and a very enjoyable coating way while it expands gently. The finish is quite long, structured and brighter than the previous vintage in my opinion. Complex with good intensity yet it seems to pause to expose its best profile and use some of its charm. Love it. I don't know about you, but Falanghina has to be one of my favorite white grape varieties with Godello, Jacquère, Roussette, Viognier, Albariño, Grüner Veltliner, Romorantin, Arbois, Chenin Blanc, Muscadet, Greco di Tufo, Erbaluce, Grechetto, Vermentino, Grenache Blanc, Roussanne, Marsanne, Inzolia, Viura, Verdejo, Loureira, Rivaner, Palomino, Semillon, Fié Gris, Trebbiano, Vernaccia, Parellada, Pardina, Pinot Blanc, Riesling and Gewurztraminer (just to name a few amongst those that I really love) and of course, but depending of the winemaker style and region of origin Chardonnay and Sauvignon Blanc. Umbria is a region of central Italy. Its capital is Perugia. It is bordered by Tuscany to the west, the Marche to the east and Lazio to the south. This region is mostly hilly and mountainous. It is the only Italian region having neither coastline nor common border with other countries. Its topography varies a great deal from the Apennines Mountains to the east, with the highest point in the region at Monte Vettore on the border of the Marche culminating at 2,476 m (8,123.36 ft), gradually descending westward towards Lazio and the bottom of the Tiber valley basin, with the lowest point at Attigliano 96 m (314.96 ft). Umbria is blessed with a similar climate to Tuscany’s: warm and dry, but cool enough, thanks to the Tiber River and its tributaries flowing through the region. The soil is mainly calcareous clay and sand, with plenty of limestone, which is ideal for growing vines. Although Umbrian agriculture is noted for its tobacco and its olive oil, its vineyards produce excellent wines, especially the whites. Another typical Umbrian product, which is also one the most sought-after mushrooms on the planet and a gloriously flavorful culinary ingredient, is the black truffle found in Valnerina, an area in the southeastern part of Umbria that produces about 45% of the entire Italian Truffle production. Umbria’s main acclaim to wine fame is that it is the home of the historic hilltop village, Orvieto, and its eponymous white wine. Recently rediscovered by the customers in the export markets over the last decade and consequently enjoying very good press coverage, this friendly white wine nowadays draws agri-tourists to the vineyards surrounding the medieval town. Other noted wines produced in Umbria are Torgiano and Rosso di Montefalco. Orvieto is the village, which gave its name to the white wine produced in the region of the same name. The region of Orvieto is located in the southwestern part of Umbria, in the immediate surroundings of the eponymous village and overlapping Lazio. It is predominantly known for its white wines made from a blend of mostly Grecchetto and Trebbiano, which are sold under two Denominazione di origine Controllata (DOC): Orvieto and Orvieto Classico. In the Middle Ages, Orvieto was reputed for its sweet, golden yellow color wine. Nowadays, white Orvieto is mainly dry, but semi-sweet styles, known as Orvieto Abboccato, and dolce (sweet), are also produced in small quantities. Blended red wines, with some time up to eight red varietals including Sangiovese, are sold under the Rosso Orvietano DOC. Also, it is not rare to see single white varietal, like Trebbiano or Grecchetto, be bottled on their own and sold under the Umbria IGT label, like the wine for this post which is a Grechetto produced by a winery called “Argillae”. “ARGILLAE” takes its name from “Argilla” the Italian word for “clay”, which is particularly abundant in the soil of this part of Umbria. Azienda Agricola Argillae is set on the hills between Allerona and Ficulle, northwest of Orvieto, and boasts some 640 hectares of land, of which 170 are planted with vine (the rest is mainly devoted to olive groves, corn and woods). The vineyards are located on the slopes of the surrounding hills, at approx 300 to 400 meters above sea level (bet. 1000 to 1380 feet) and enjoy great exposure to the east and west with ideal microclimate. The Terroir is characterized by rock formations called “calanchi”, a type of badland formed by erosion in clayey bedrock, particularly along the river valleys, some 2 millions years ago. As a proof that this area was once under water, the land is rich in fossilized seashells and turtle shells. With the expertise of renowned oenologist Lorenzo Landi, Argillae winery offers 3 interpretations of Umbria wines that reflect its land and its history, with a Grechetto, an Orvieto and a Sinuoso. The one that particularly attracted my attention and especially startled my taste buds was the Grecchetto. Crafted by recognized oenologist Lorenzo Landi, Argillae Grechetto Umbria IGT is produced from 100% Grechetto planted on hill-slope vineyards facing south-southwest, at an altitude of about 365 meters of altitude. Growing on calcareous-clay soil, the vines are cordon trained and spur-pruned. The grapes are carefully selected and hand harvested in the vineyard, then submitted to a brief cold maceration process in a closed press and finally pressed delicately. The resulting juice is racked and vinified in stainless steel at controlled temperature (59-62F). Its subsequent refining on fine lees enhances its sensory properties. Malolactic fermentation is carried out in stainless steel tanks and barriques, where the wine spends another 5-6 months before bottling. 6-7,000 bottles of this particular wine are produced each year. The 2008 Argillae Grechetto has a super pale yellow color, almost transparent with steely reflects. The nose is bright and mineral, with discreet aromas of white and yellow fruit intermingled with a fresh touch of sea breeze. The palate, resembling somewhat a Muscadet, is clean, bright, light on its feet yet quite complex and structured. The malo and time on its lees conferred a certain ampleness, yet it remains very summery with the same fruit and Terroir characteristic as the nose and that same iodine touch (remember my post on Salty wines? No? Read it at www.ledomduvin.com/2010/04/salty-wines-or-wines-with-hints-of.html). The crisp and lingering finish is ultra refreshing and inviting. This is an excellent summer white wine, and a steal at this price! On its own or with food, this wine is a versatile crowd pleaser. Love it. I personally love the wines from the northern part of Italy, more especially those from Piedmont, Val d’Aosta and Friuli. Growing mainly on slopes, more or less high, on the foothills of the Alps, the wines produced there present great minerality and enhancing acidity, conferring the resulting wines a lot of appeal, depth, brightness and complexity, without being heavy or too full. Often age worthy, these wines whether white, red or rosé are usually very attractive, earthy, focus and inviting. Yet, there is another region in Italy that I love. No it is not Tuscany, although I appreciate it a great deal, I prefer Campania. The volcanic soil of this wonderful sunbathed region of the southwestern Italy confers to its wines great complexity, minerality and earthiness, which are very-difficult-to-dislike features (especially in wines). Made from 100% hand-harvested Aglianico grapes coming from10-20 year old vines grown between at 1,000 - 1,650 ft above sea level around the communes of Taurasi, Pietradefusi, Castelvetere and Paternopoli in Campania. Planted in deep soil with moderately large grains originally from ash and fallen pumice. After de-stemming, free-run juice underwent a 12-hour maceration on the skins followed by a temperature controlled fermentation stainless steel tanks. The resulting wine is stunning. 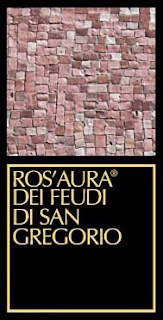 The 2009 Feudi di San Gregorio Ros'Aura Rosato was a revelation and a very enjoyable surprise, surely one of the most inspiring Rosé(s) I tried this year so far. It has an attractive, intense and fairly deep colorful rose color. The nose is inviting with ripe, candied wild red berries and cherry fruits intermingled with earthy and mineral notes. The palate is medium bodied with great minerality enhanced by fresh and lively acidity with notes of freshly crushed wild berries on the lingering finish. Neither to dry neither to full, and definitely not sweet but rather full of mineral with juicy acidity and a great way of coating the palate, this is a very versatile and definitely food friendly wine. Great on its own, it will be perfect as an aperitif and delicious with chicken and turkey entrées, fish and grilled vegetables. Feudi di San Gregorio is surely one of my favorite wineries of Campania and I’ve always enjoyed their wines (read my previous post on Feudi di San Gregorio at www.ledomduvin.com/2010/05/2008-feudi-di-san-gregorio-falanghina.html). Yet, Terredora di Paolo that I discovered more recently is equally good and interesting. Both made me come to the conclusion that my palate is indeed very inclined to Campania’s wines, more especially the whites. As I am writing, I’m enjoying a few glasses of the younger sibling of the 1995 Taurasi that I described in a previous post: 2003 Terredora Dipaolo Taurasi DOCG Campania Italia. Located in Montfusco, a village north of Avellino, Terredora is a continuation of the ancient story of Campania, its people and their passion for their land and their winemaking. TERREDORA has been on the forefront of the wine renaissance in Campania since 1978. Today, with more than 150 hectares of vineyard land, Terredora is Campania’s largest wine producer and vineyard owner, with a worldwide reputation for the quality of its wines. Their commitment to excellence was proven in 1994 when they decided to vinify their own grapes. This decision was prompted by their belief that great wine comes from the balance of natural resources: terrain, varieties used, climate and man’s ability to work with nature. Made from 100 % Aglianico grape variety, from vineyards in Lapio and Montemiletto, carefully selected and hand-harvested, the Terredora Dipaolo Taurasi was aged in small French oak barrels for 18 months. After blending the maturation continues in 35 hl oak barrels for 12 months and then in bottle for a further 8-12 months before release. The 2003 vintage was unusually hot across the board in Europe, and I have always been a skeptic regarding how long some of these 2003(s) will last and take to integrate, and more especially how will they taste. After tasting many 2003 vintage wines from many European countries, I can say firmly that I’m not a fan of this vintage for sure. In fact, due to a certain ripeness (or even over ripeness) and lack of acidity and harmony and even structure, resulting in heavier-than-usual fruit forward mouthfeel for quite a lot of wines from Bordeaux and Ribera del Duero to Greece, some of these wines were not great. They didn’t necessarily reflect their Terroir and region of origin for most of them. Moreover, that over ripeness with high alcohol content and unharmonious, slightly disjointed profile didn’t help for the sales. New world riper style of wine drinkers probably found them more to their taste, but, in my opinion, most 2003 wines had nothing to do with their usual selves in better or regular vintages. Although not as good as the previously tasted 1995 vintage, the 2003 Terredora Dipaolo Taurasi DOCG Campania is a good, fruit forward wine that is ready now and not surprisingly don’t even need decanting. It has a medium to deep garnet color with slightly orange brick reflects. So far nothing too unusual! The nose is quite strong and aromatics with warm, ripe dark fruit and plum intermingled with earth, underbrush, spicy and woody notes, and hints of alcohol. Secondary and tertiary aromas are also appearing, a sign of premature ageing that is not wanted, but not unusual for this particular vintage (like most European 2003(s). The palate is ultra ripe with dark ripe fruit and berries, plums, dark spicy chocolate, earthy cider wood and pepper. The attack is quite full and expanding with oak and slight burnt touches. The finish is quite dry, a bit short some will say, with mixed slightly astringent and ripe tannins (in the same time) that appear a touch bitter (which not surprising either for this vintage). Overall, even if not my style, the wine is not that bad, just a bit too typical from the 2003 vintage for my taste buds. But don’t get me wrong, it is perfectly drinkable and enjoyable and definitely remains a good earthy Aglianico (with a bit more scorched fruit than usual, granted!). On its own just now as I’m writing, it is warm, earthy and chocolaty and somewhat inspiring. Fortunately, Terredora Di Paolo makes tremendous wines, and as I always say: a good winemaker will always make good wines good year bad year. Of course, it is often difficult to predict hazardous weather and other climatic conditions, like those of 2003. We just bought (for the store) 3 wines from Terredora di Paolo, which are tremendous examples of the quality that this winery constantly achieves. The leading example is their benchmark Falanghina, which is a very versatile and inviting white to enjoy at any moment. The second wine is their Greco di Tufo, which is quite outstanding in most vintages. The maceration of the grapes, at 24-25°C, does not exceed 7 days in order to obtain an excellent extraction of color without creating a heavy tannic structure. Aged in wood and stainless steel tanks, this wine succeeded to maintain great aromatic and freshness with complexity and depth that makes it an attractive ready to drink young wine. 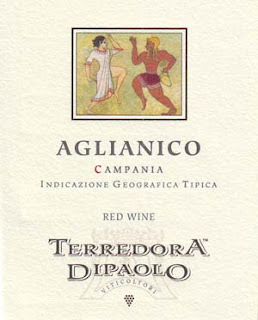 The 2008 Terredora di Paolo Aglianico Campania IGT has a fairly dense ruby-purple red color with slight garnet reflects. The nose has bright dark cherry and ripe red cherry aromas with spicy and earth notes topped by violet scents and a slight gamey character. The balanced and Terroir oriented palate is forward, gentle and earthy with dark berry flavors and soft subtle oak characters mixed spicy hints, enhanced by excellent acidity. The lingering earthy finish is delightful and juicy, with a slight tannic touch that will integrate with a bit of time. Overall, it is a very nicely crafted wine and I liked it a lot. The 2007 vintage was already quite nice; the 2008 seems slightly fruitier or juicier with good acidity and enjoyable harmony. Pair it traditional Italian and Mediterranean dishes including "charcuterie", soups and pasta dishes, lasagna, white meats and light main courses. Drink more Biodynamic, Biologique and Organic wines (and spirits and food) from sustainable culture and respect the environment! Support the right causes for the Planet and all the people suffering all around the globe! Also follow projects and products from the Fair Trade, an organized social movement and market-based approach that aims to help producers in developing countries obtain better trading conditions and promote sustainability. Thinking about it, the eating part is surely the most important part of all. Locals are always proud to taste the products of their land and their region and more especially proud to continue what many of their ancestors did before them and guard preciously the recipes that made certain places famous and a real culinary destinations for those who were not locals. Over the years and the centuries, these recipes became the pride of a region or sometimes of a village. Even now most people always have real pleasure to retrieve with joy and smile the food that make them so happy when they were young, having a sampling "dégustation" of the dishes while they were cooking for the Sunday lunch or dinner at their parents, or their grandfather or their grandmother house with the rest of the family. I personally have hundreds of really enjoyable memories of these moments shared with my family in the countryside of the "Côtes de Bourg" at my late grandfather house, with endless Sunday lunches eating the specialties of Gironde and Aquitaine: Home made "Paté de lapin et de cochon" (rabbit and pork Paté), "Foie gras", "Coq au Vin", "Lamproie à la Bordelaise", Poached "Anguilles", "Cassoulet de Castelnaudary", "Saucisses Lentilles de Toulouse", "Poulet Basquaise", "L'Agneau de Pauillac", "Lapin à la Persillade", "Huîtres du bassin d'Arcachon et du Cap Ferret au caviar d'Esturgeon d'Aquitaine", "Crevettes de la Gironde", "Gesiers de Canard", "Canard Fermier des Landes", "Esturgeon d'Aquitaine croustillant, purée de chataîgne aux épices", "Tomates Farcies", "Escargots à la Persillade" and so many more other dishes served with Pleurotes, Chanterelles, Ceps, or just a simple lettuce salad, some potatoes, asparagus, tomatoes, french green beans, "potiron", carrots and more, and all of these from my grandfather's garden. Home grown fruits and vegetables, nurtured the organic way conscientiously following the seasons and the ancestral signs of mother nature, like the wine he was making. To me, happiness is the emotional component you experience as a part of your everyday life with friends and family, or other people surrounding you, even for a brief moment. These moments that make you smile and make you feel good, proud or just happy to share them or to witness them. Remember the good ones and forget the bad ones, you cannot come back on the bad, so might as well try to get a positive lesson from them and move on. The best memories will always make you see life for what is worth and how great it can be. Although simple and rare, these were moments of bliss. Sometimes, one of the gentle and adorable furred rabbits or the annoying rooster was killed and prepared early in the morning for the late Sunday lunch. It was a feast. The family was once again united to share a happy moment. Different appetizers, various salads with crudités, homemade pâtés and sliced “Jambon de Bayonne”, along with other regional specialties battled on the long table with the butter, the bread, salt and pepper, oil and vinegar and everything else needed to eat and drink and share a great afternoon together. Bottles of wine were open and everybody was happy. If I’m telling you all these, it is because a friend of mine offered me a book called “Le Soleil des Scorta” (or “The House of Scorta” in English) from Laurent Gaudé, and I really enjoyed it. It is a story about life and people and these rare moments of happiness and the struggle to live the best we can with what we have, depending on our convictions, our beliefs and our origins. It is a great book about life and generations through the eyes of a family living and evolving in Montepuccio, a small fisherman village in southern Italy, spread out from 1875 to now. In my opinion, everybody should read it, and more especially the expats wherever you are. It was a great read in French, I assume it must be equally good in English (despite may be certain language "subtilités"). “Merci” to Laurent Gaudé for such an interesting, approachable and memorable book. And also “Merci” to Didier and Éléonore who recently offered me that book for my birthday. 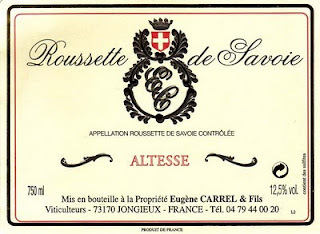 Ok, let’s face it; it is another post about Savoie. Unbelievable, summer is here, and all I can write about is Savoie, Savoie and more Savoie. But you know what? Why not? After all, it comes “très á propos” in my quest of always trying to introduce you to lesser-known regions, grapes and wines from around the world crafted by small artisanal producers and family owned estates. Granted, after reading my last 3-4 posts about Savoie wines, you must be extremely knowledgeable and on the verge of getting annoyed or bored. But what can I do, these wines are great! And the Savoie region remains so undiscovered for so many people. I just want to talk and write about it. After writing about great producers like Eugène Carrel et Fils, Andrien Berlioz, Gilles Berlioz, a few of the Quénard (and God only knows how many they can be within this huge family, at least 6 different that I know of), Thierry Tissot, and René & Beatrice Bernard from Cellier du Palais, I couldn’t write about another wine from another region without writing something about Pierre Boniface, one of the most recognized personality of Savoie and surely one of my favorite Savoie producers. I guess it came from my Bordeaux origins and the fact that at that time, Robert Parker Jr. critics were more in favor to heavier wines and were setting the trend. But all of this has changed, more than 18 years of tasting and nearly 14 years of wine buying later, my palate has considerably developed to become the discriminating and dissecting tools that ever since has shaped and ruled my everyday life at work but also at home. Harmony, freshness, minerality, balance, crispiness, varietally correct and Terroir oriented features, rapidly replaced over-ripe, heavy, alcoholic, woody and jammy, in my wine vocabulary. And somewhat, I was terribly influenced by the wines of the Loire and Burgundy, but I need to admit that the wines from Jura and more especially Savoie startled me the most and enabled me to make that change and sharpened my taste buds. Pierre Boniface wines are produced at “Les Rocailles”, a “lieu dit” of St. André-les-Marches, a little village nestled in the Savoie Vallée, about 13 kilometers south of Chamberry, in the foothills of French Alps. Established for centuries in the village of Apremont and its immediate surroundings, the Boniface were always connected to agriculture and viticulture. They were winegrower and Négociant. Conducting a modest business, Pierre’s father was only farming 20 acres (about 8.10 hectares) and buying grapes from another 20 on handshake deals when Pierre took over. Gradually, Pierre Boniface grew the business and expanded his vineyards and although not the largest, he became one of the larger estates in the area of Les Marches, and consequently of Savoie. 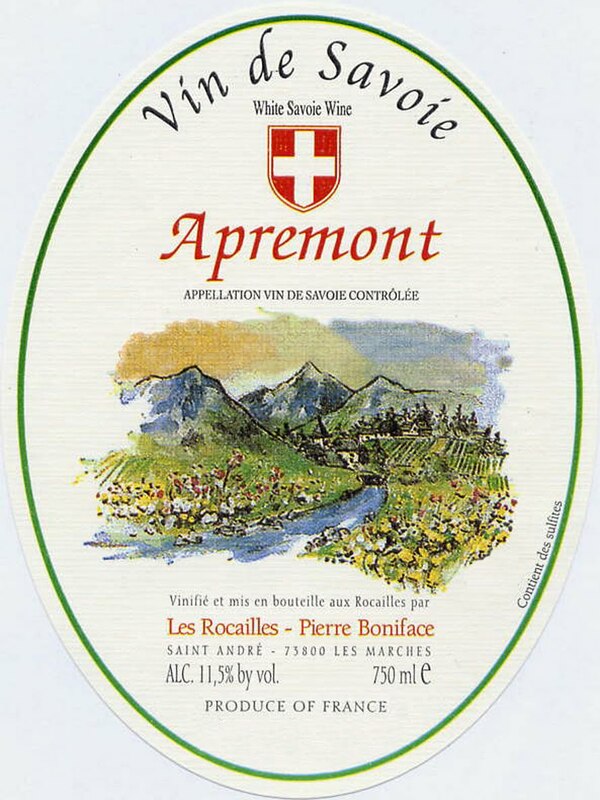 Les Rocailles now owns nearly 50 acres (about 20 hectares) in Apremont, which provide half of the grapes for his 25,000+ cases annual production of his Apremont, and purchases grapes from nearly 60 more acres (about 24 hectares) under contract with his neighbors. Boniface buys grapes, but never bulk wines; thus, every bottle he produces are fermented and vinified in his cellar and bottled at the property. The vineyards constitute of about 40 acres Jacquère for Apremont owned, and 40 leased. In addition, the estate owns about 8 acres of Roussette, leases about 15 acres. Atop all that, they also have small acreages of Chardonnay for their Brut, some more Jacquère for their “Abymes”, and some Gamay for the rosé and some Mondeuse for the red. And finally, three acres of Roussanne are leased for the production of Chignin-Bergeron. Pierre Boniface several Savoie wines, including: Apremont, Brut de Savoie NV, Caprice des Rocailles Sparkling Rosé NV, Roussette de Savoie and Mondeuse and Chignin-Bergeron. Understandably, Apremont is Boniface’ s signature wine. Produced with 100% Jacquère, it accounts for 70% of the production, with a vast majority sold to the export markets. 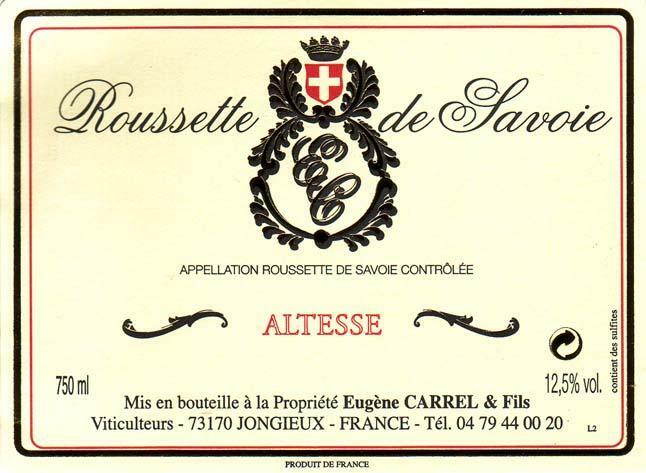 This great value white is the perfect introduction to the unique and distinctive wines of Savoie. Growers like Pierre usually look forward to passing their domains on to their children, but in this case, it was just not meant to be. His daughter Miriam is a computer systems architect and his son is literally a rocket scientist. Pierre subsequently sold the business to Guillaume Durand and Alban Thouroude, two young men (born and bred in Savoie) with MBA's from the University of Grenoble. All of the winery/vineyard staff has stayed on, and Pierre will continue to actively consult for the next few years. Yet, even under new management the quality has not decreased, on the contrary, it has evolve and aim for higher ground in complexity. Pierre Boniface has now become a brand, a name expressing quality and Terroir driven attitude, recognized and often praised by the press and the critics. Pierre Boniface Apremont is made with 100% Jacquère, from vines of more than 40 years of age in average, in both owned and leased vineyards. The yields are of 4.75 tons/acre (about 9 tones per hectares). The wine doesn’t see any oak at all to preserve freshness and fruit quality, and is vinified in temperature controlled stainless steel tanks. Alcohol is usually quite low, usually 11% (or sometime a little less) and rarely above 12.5%. 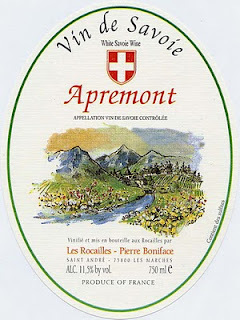 Apremont is often dry but not tart, flowery but not too perfumy. Recent bottling may present a little CO2, a touch of “pétillance” or light fizz on the tongue, if you prefer. Once again, you’ve got to love Savoie white wines. Fresh, limpid, crisp, vivid and full of minerals that add almost a touch of purity, this Boniface Apremont is no exception. What a wine! Behind its pale straw-yellow color, the aromas are a beautiful cocktail of fresh summer white and yellow fruits including peaches and citrus mixed with mountain dew on pasture grass. There is also a delicate but distinct blossom, flowery element; also reminiscent of the nearby Alpine meadows intermingled with the minerality of the icy glacier spring waters. On the palate the wine is light on its feet, yet complex and delicate like a dancing ballerina. The lingering finish is particularly smooth, pleasingly dry and surely inviting for another sip. In warm and hot weather, only water, Muscadet or some very dry Moselle Rieslings can compete as ultimate thirst-quenchers. It is infinitely refreshing. Pair it with Savoyard’s specialties like: Raclette and Fondue Savoyarde, Paté en Croute, and the unmistakable “Tartiflette” (Oven baked potatoes with cream, bacon and sautéed onions topped with farmhouse Reblochon cheese, served with green salad) or simply with mussels or Provence-style shrimp “sautée”, flavored with a dash of Pernod. Bonne retraite Pierre Boniface! And let’s hope that they will continue to walk in your steps long after you will have left your few consulting years.